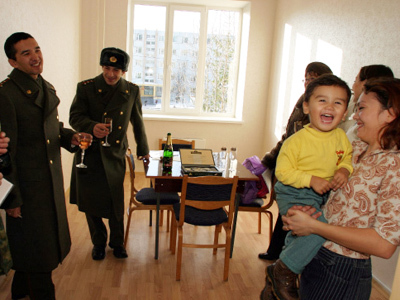 President Dmitry Medvedev has stressed that the deadlines for providing military personnel with living quarters should be strictly followed and by 2012 there should be no officers left on the waiting list. On Wednesday, the president visited a newly-built residential area in the town of Podolsk, Moscow Region, where several dozen apartment blocks for the military have been built recently. After inspecting the new buildings, Medvedev stressed that the issue regarding the provision of officers with housing should be sorted out strictly within the presidential order. He recalled that it had been agreed earlier that all the military who retired before 2005 would receive homes in 2010, and those who left service after 2005, should be provided with housing in 2011 and 2012. Medvedev stressed that it is the deadline the Ministry of Defense should keep in mind, and in two years’ time there must be no officers left waiting to get their own homes. All the military being provided with homes would be “an unprecedented situation” in the entire history of the Russian armed forces. 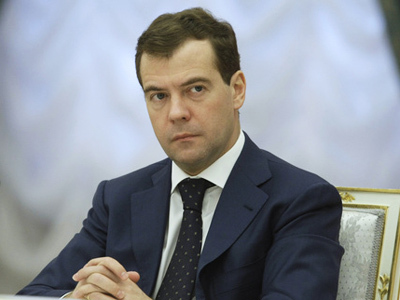 “Nothing like that has ever happened in Soviet or post-Soviet times,” Medvedev added. "We have started this work [to provide the military with housing] and will bring it to its end, despite the financial crisis," he said, cites Itar-Tass. Medvedev underlined that in addition to building houses, it is important to develop infrastructure, such as kindergartens and medical facilities. “I think special programs for the resolution of this issue are quite effective, and I will tell you frankly: I do not feel ashamed of them," Medvedev said. In recent years “thousands of officers have received keys to new flats” and work in this direction will continue.